The Queen Mary 2 is the flagship of the Cunard fleet and so this luxury liner will, in superb style and class, take you on an elegant voyage around the world. In 2016 the flagship, Queen Mary 2, was transformed inside and out resulting in a merge of contemporary and timeless elegance. She is fitted with luxurious staterooms, endless opportunities to be entertained and equal chances of uncovering spacious ares to relax. The 'Britannia', the main restaurant on the Queen Mary 2, is set in a magnificent hall and provides exquisite food nightly and the finest White Star Service. For lovers of the arts, there is one of the largest libraries at sea as well as the art gallery featuring works by Dali and Picasso amongst others. For entertainment on board the elegant two-story 'Royal Court Theater' will host wonderful Jazz and Blues concerts, musicals and high class shows. You can enjoy drinks in the premium wine bar the 'Carinthia Lounge', the 'Commodore Club' will serve you their famous Martini creations, and visit Sir Samuel's for a decadent Godiva treat. Known for her Transatlantic voyages, the Queen Mary 2 is one of the most elegant and unique ways to travel the oceans of the world. 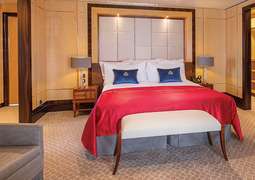 Queen Mary 2 is home to an array of different stateroom categories. 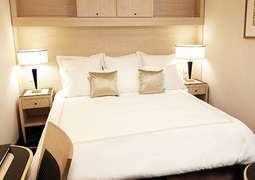 All modern amenities will be available in your stateroom ensuring you have the most pleasant cruising experience possible. 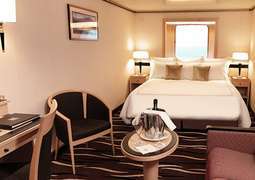 Choose from inner cabins, outer cabins and balcony cabins or from the luxurious Princess Suites, to experience true luxury at sea with full butler service as well as other benefits. The cuisine on board the Queen Mary 2 offers everything you could wish for. Restaurants on board include the 'Britannia' restaurant for all guests or the 'Britannia Club' restaurant, which offers a more intimate dining experience for club guests. 'Kings Court' restaurant offers round-the-clock dining, with a large selection of culinary options presented in a buffet-style. For that special occasion we’d recommend 'The Verandah' for luxury dished designed by the maître de cuisines. Casual dining options such as 'Bamboo Cafe' offer hot dogs, hamburgers and more fresh from the grill. No matter what you're in the mood for the selection on board Queen Mary 2 will not disappoint! Endless entertainment awaits you on the Queen Mary 2. The ship boasts a cinema, the 'Royal Court Theatre', a planetarium and an auditorium, as well as the 'G32' nightclub where guests can dance the night away. You can also try your luck at 'Empire Casino' or taste a vintage red from our extensive cellar with our sommeliers after a long day of activities on board. If you want to take a break from taking a break, there are many options onboard the Queen Mary 2. There are five swimming pools, a jogging track, a gymnasium, a golf simulator and an open air arena with shuffle-board, table tennis, paddle tennis and basketball. Dance lessons are also available on board and are a fun way to learn a new talent and mingle with fellow cruisers. For something a bit less active you can read a good book in the library, which just happens to be the largest library on board any ship. The exclusive 'Canyon Ranch Spa Club' stretches across two decks and serves the most relaxing Canyon Stone Massage, Ayurvedic or Thai treatments. Several different saunas, a thalasso pool, an aromatic steam room, hydrotherapy pools and different massages promise a rejuvenating and unforgettable pampering experience. Numerous yoga and aerobic courses complete the wellness offerings ensuring you achieve your zen. Internet on board: Internet access is available for a fee. The Queen Mary 2 is the third largest cruise ship in the world and the flagship of the fleet by the shipping company Cunard. On its 345 meters, it has 13 decks with 1310 passenger cabins. 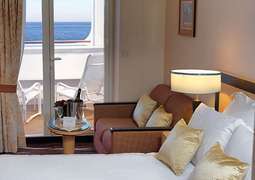 For double occupancy the Queen Mary 2 can accommodate up to 2620 guests. These are provided by a crew of 1253 crew members. The QM2 is from 2004 and was built by the French shipyard Alstom Chantiers de l’Atlantique. Since its completion, it has been on the oceans under the British flag. The huge luxury ship fulfills every dream. Here it will be neither boring to you, nor will you be astonished at the power of the ship. The British-style ship will enchant you in no time. As on all Cunard ships you will also feel majestic on the Queen Mary 2. Thanks to the facilities, you can also treat yourself to a royal treat. The magnificent spa and wellness area of ​​the shipyard Canyon Ranch SpaClub is the perfect place to relax. Here you can finally forget the everyday life and concentrate completely on yourself. You will also have the time in a good book. The library of the ship is at your disposal. But that’s not all. Fitness studio and swimming pools are also on board. In the evening, you can also enjoy watching one of the thrilling shows in the theater. The offer is not too small. Even the choice of restaurants on the Queen Mary 2 leaves nothing to be desired. Five different restaurants offer you meals of the highest standards. Here everyone will be able to enjoy their meal and enjoy an exquisite dish. With the Queen Mary 2 it is worth to experience a transatlantic cruise. On a journey between Europe and the American continents, you can especially discover the advantages of the ship. In between, there are of course also exciting cities and regions to be discovered; Such as New York and the Caribbean. The Queen Mary 2 is also home to the Mediterranean Sea and the Northern European Seas. These European targets are also very popular. Here it is easy to see many different interesting cities in quite a short time. Of course, you can also explore the Caribbean with the Queen Mary 2. There are beautiful beaches and interesting cultures to discover. Have you already been enchanted by the Queen Mary 2? Then book with us on the CruiseAway website. Our professional cruise experts will gladly help you. Use the free hotline to get expert advice on 1300 887 590. The CruiseAway team wishes you a fantastic cruise with the Queen Mary 2!